On Wednesday, several media outlets reported that “longtime friends” of former Trump campaign manager Paul Manafort, who has been indicted on a dizzying number of charges that include tax evasion, bank fraud, money laundering, and conspiring against the United States, have launched a website to collect money to pay for his mounting legal fees. Manafort would hardly be the first Trump associate with hefty legal fees to have friends seek the public’s help—allies of former Trump national security adviser Mike Flynn, former FBI Deputy Director Andrew McCabe, and even supporters of Trump himself have established legal defense funds—but something about the Manafort defense fund seems very, very off. When I attempted to verify that the fund was, in fact, run by Manafort’s allies on Wednesday, I was met with several roadblocks. From there, the rabbit hole deepened. No one wanted to speak to me on record; no one has taken responsibility for the fund; and there is no transparency around how the money is collected and accounted for. It’s suspect on its face that a man under federal investigation for a career in money laundering would be supported by a mysterious, opaque website seeking money with zero transparency about where the money is going, how much it seeks to collect, or who is running it. The lack of answers to the most basic questions only makes it more so. 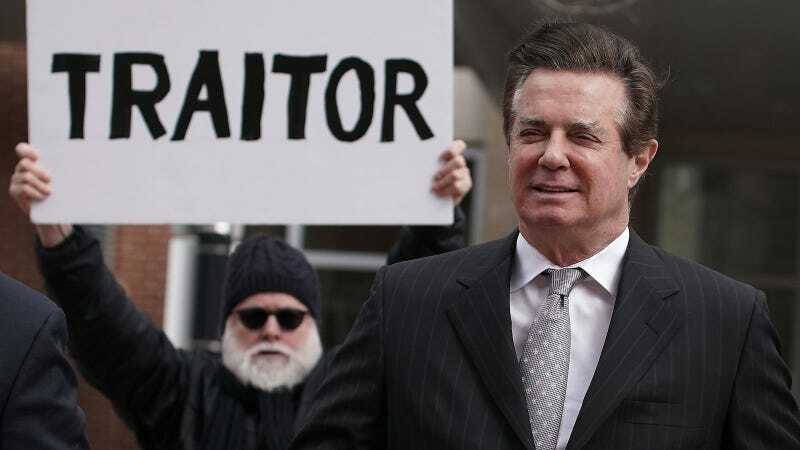 Created by longtime friends, the Paul Manafort Defense Fund [manafortdefense.org] was established to support the Manafort family as they battle false allegations, government leaks and smear campaigns related to the proceedings brought against him by the Office of Special Counsel. The Defense Fund is urging anyone who values civil liberties and wishes to show the “Deep State” that they cannot exert their will on ordinary citizens, to join them in supporting the Manafort family as they grapple against the Special Counsel to clear their name. “That doesn’t say it’s going to his criminal defense lawyers,” she said. The website does not provide a specified donation goal. Supporters were initially instructed to make checks out to the very generic-sounding “Legal Defense Fund Irrevocable Trust” and mail them to a P.O. Box in Clifton, New Jersey, which Clark found peculiar. “It’s interesting that they’re able, presumably, to deposit checks made with these words and those words don’t include ‘Paul Manafort,’” she said. “I look at this and I kind of wonder if it’s just a fraud, to tell you the truth. The fact that there are no human beings visible would be a red flag. Who’s responsible?” Curiously, just hours after our interview on Thursday, the site changed the trust name to the only slightly less generic-sounding “PM Legal Defense Fund Irrevocable Trust.” I’m guessing that PM stands for Manafort’s initials. It’s “not at all clear that this even goes to Manafort’s legal expenses,” Clark said. The site claims that any money left over after Manafort’s legal bills will go to either the ACLU or the Brain Trauma Foundation, the latter of which listed Manafort as a director on a 2016 tax filing, its most recent. (An email inquiring about Manafort’s tenure as a director, sent to Brain Trauma Foundation president Jamshid Ghajar, was not returned, and the phone number listed on the tax filing was no longer in service). Manafort’s defense lawyers, who are under a gag order, did not respond to multiple emails requesting verification of the legal defense fund. Special Projects Desk editor Tim Marchman donated one dollar to the fund, getting nothing informative on the receipt for his trouble; he also emailed the site to find how to send funds via wire transfer, but did not receive a response. I emailed Jason Maloni, Manafort’s spokesperson and, as of Wednesday afternoon, the only non-reporter following the @manafortdefense Twitter account. To my surprise, he responded, claiming he was off the record, though I had not agreed to those terms. “Off the record, I can tell you that it is legitimate, however, I am not behind the defense fund, nor is Paul,” he wrote. “If you see reports of a news pitch going out today, that is not coming from me.” On Thursday, the Washington Post reported that “A person familiar with Manafort’s situation confirmed that the fund is legitimate,” but provided no name. “Off the record, I can tell you that it is legitimate, however, I am not behind the defense fund, nor is Paul,” he wrote. The Post also reported, citing Internet registration records, that the site was registered in December, with the name of New Jersey real estate attorney Bruce E. Baldinger, who has worked with Manafort, on the records. Baldinger did not respond to my request for comment, and his role, if any, in the administration of the fund remains unclear. Even if the fund is legitimate, there are still questions about how the money will be collected and used. The website says: “Donations from foreign individuals, corporations and other entities are subject to public reporting.” This statement means very little, Clark says. “For instance, I can’t tell whether they’re talking about foreign corporations or all corporations,” she said. “I honestly don’t know what public reporting they are referring to.” While there are numerous reporting regulations around trusts established to pay for legal fees of federal employees, Clark is unaware of any regulations for someone like Manafort. If the fund accepts donations from entities, “then it’s basically opened doors for donations through those entities from anybody,” including, Clark added, “foreign oligarchs.” According to the website, “trustees may, in their discretion, reject any gifts they deem inappropriate,” but the site doesn’t explain who, if anyone, would be rejected, or why. (Even Flynn’s donation fund specifies that “donations that are identified as originating with foreign nationals will be declined or refunded.” It also has a named trustee, to whom checks can be made out.) My email inquiring about accepting donations from entities was not returned. “How do you know that it isn’t just a U.S. entity standing in for an oligarch?” she asked—a pertinent question when the benefactor is a man who allegedly worked with foreign oligarchs without the U.S.’s knowledge and is alleged to have committed multiple financial crimes. Whoops, Here&apos;s a Brand New 32-Count Indictment Against Paul Manafort and Rick Gates!